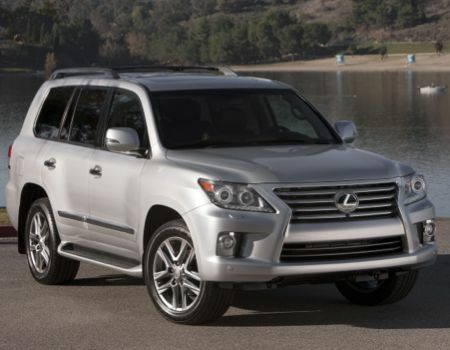 There is a wolf in sheep’s clothing over in the Lexus stable and it comes in the form of the flagship 2014 Lexus LX 570 full-size luxury SUV. Be it atop the Continental Divide or the swankiest new spot in South Beach, occupants arrive in opulent style for any occasion in any location in this capable three-row luxury utility vehicle. Lexus first brought LX to light in 1996 and since it has earned a reputation for offering full complement of luxury amenities with a “go anywhere, do anything” attitude. Sharing its architecture with the Toyota Land Cruiser the LX 570 employs a rich global heritage to offer modern-day adventurists. 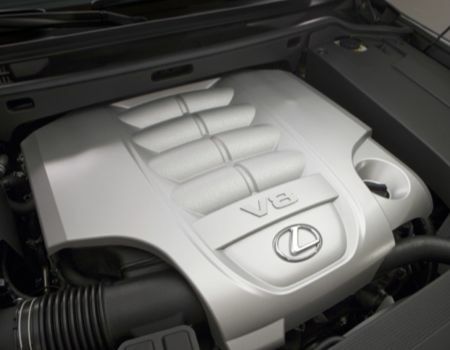 The big Lexus was given a thorough makeover for model year 2013 and its power comes from a beefy 5.7-liter V-8 engine producing 383hp and 403 lb. ft. of rock-crawling torque. Four-wheel drive is standard for the model as is the six-speed automatic gearbox. This combination allows for 90 percent engine torque available at just 2,200 rpm and capable to tow up to 7,000 pounds. Four-wheel drive duties are handled by a slick combination of Torsen limited-slip locking center differential with a standard power split of 40:60 that can be altered via onboard systems such as four-wheel Active Traction Control system to help control wheel slip and the Multi-Terrain Select system that allows drivers to tailor the drive system to match a variety of terrain including rock, rock and dirt, mogul, loose rock or mud and sand. Other systems aiding the LX in reaching its full off-road potential include a low range for the gearbox, Active Height Control to add two inches to ground clearance and Crawl Control with Turn Assist and Hill-Start Assist Control for more extreme conditions. Given the off-road capabilities of the LX 570, one might think the vehicle not suitable for a classy night out on the town. To the contrary, the Lexus really shines in the urban setting as well thanks to Adaptive Variable Suspension with settings for comfort, normal and sport modes and the Active Height Control allowing for easier ingress/egress of passengers. 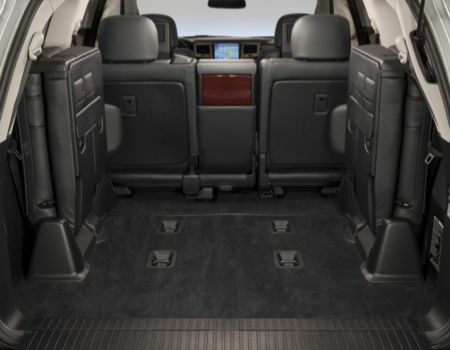 The LX 570 can seat up to eight but when cargo space is required the third row seats can be folded out of the way thanks to its convenient power function and with the 40/20/40 split middle row folded flat the luxury SUV offers 83.1 cubic feet of space. Along with the array of standard safety and on- and off-road driving technologies comes a lengthy list of amenities and creature comforts including leather and wood interior components, navigation with voice recognition, premium audio packages, the latest Lexus Enform infotainment system with eDestination, NavTraffic NavWeather and App Suite, adaptive front lighting, 20-inch alloy wheels with mud and snow tires and like power adjustable everything else. 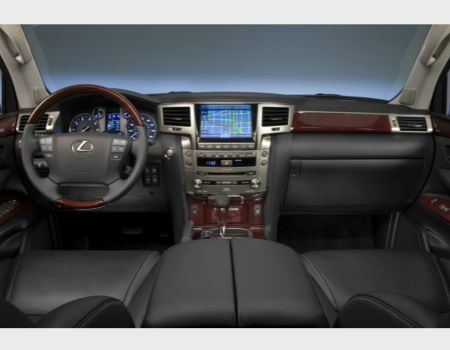 The test vehicle arrived with a few extra goodies courtesy Lexus including Luxury Package, Mark Levinson audio system, dual-screen DVD rear-seat entertainment package and Intuitive Park Assist with wide-view front and side monitors. 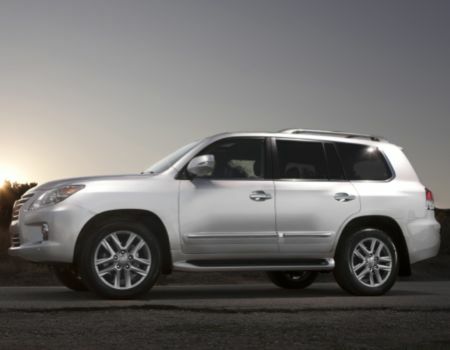 Lexus luxury does come with a price and for the 2014 LX 570 that price starts at $81,780 with this loaded tester arriving with a final sticker at $89,555. Fuel economy is rated at 12 mpg city and 17 mpg highway. 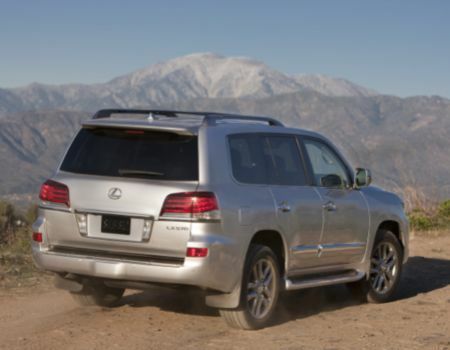 Lexus delivers true comfort and capability with its flagship SUV, and while many owners will never take their LX 570s off paved surfaces, isn’t it great just knowing that you can?